Intel has changed the game in the Mini PC category. With a wicked new look and redesigned chassis, the 8th gen Intel NUC unleashes maximum performance for PC gaming, content creation and workstations. The Hades Canyon NUCs deliver High-End Gaming Class VR-Ready Graphics in a cost, power and space-efficient package. Perfect for video editing, video rendering, graphics editing, serious high-end business applications and running multiple applications at the same time. When the work is done and it’s time to play, the Hades Canyon VR can play the latest and hottest games at full rendering at a minimum of 60fps and a typical competition setup running 144 to 200fps, all while running at a fairly quiet level and using less than 130 watts of power. Its small size means you can take it with you and the VR-Ready version can help you become immersed in stunning virtual realities and fully immersive games. Experience extreme with the newest Intel NUC kit, completely unlocked and ready for overclocking so you have the high performance you need for immersive virtual reality adventure. Built with an unlocked 8th gen Intel Core i7 processor ready for overclocking and Radeon RX Vega M graphics so you can clearly see every single movement, the NUCs are optimised to give you every GHz of performance you need for extreme experience in the virtual world. There's room for up to 32GB of DDR4 RAM and two M.2 slots for SSDs so you can store data locally and load maps fast. Dream with your eyes open with the newest VR-optimised Intel NUC with Radeon graphics that lets you play your AAA games and bring virtual reality from the backroom to the living room. With an unlocked 8th gen Intel Core i7 processor and Radeon RX Vega M graphics with 4GB of dedicated high-bandwidth memory, the NUCs delivers graphics required for immersive virtual reality. On-board Intel graphics assist in streaming video during live game play, while the discrete third-party graphics handle your high-performance gaming. The NUC8i7HVK features the Radeon RX Vega M GH graphics while the NUC8I7HNK uses Radeon RX Vega M GL graphics. To give you an idea on the performance of GL version, it is equivalent to the nVidia GTX 1050Ti and the GH version is around a 40% increase in performance compared to the GL. The smallest VR-optimised package available today means that you can set your Intel NUC out of sight in your living room or drop it into your backpack and head off to a LAN party. With a redesigned thermal solution and chassis, the Hades Canyon NUCs are designed and optimised to be the smallest VR package available today. At just 1.2 litres, the Intel NUC kit packs all the performance of a desktop tower in a device that can fit in the palm of your hand and uses less power than your average gaming desktop PC. 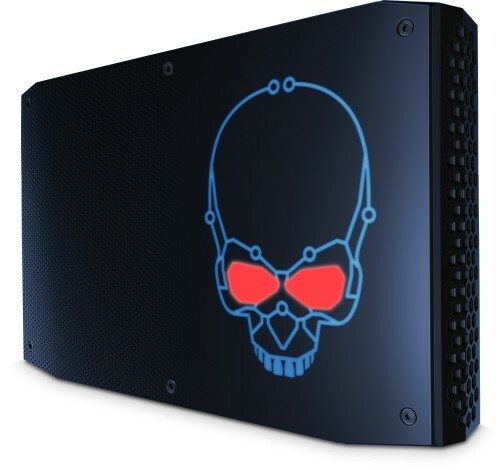 Intel have not published the noise levels of the Hades Canyon NUCs so we thought that we would mention them. They are supplied with one small fan that is used to cool the CPU. At idle the fan noise is just about noticeable in a very quiet room. The noise becomes more noticeable as the temperature of the CPU increases. Therefore we recommend either the i3 or i5 NUC if you are looking for a quieter option, although if performance is more important then the Hades Canyon will fit the bill.